Οδηγός χιονοδρομικού για Ravna Planina, χάρτης περιοχής και διαμονή για Ravna Planina. Χιονίζει σε Ravna Planina ;Ευχαριστούμε! Ski center/resort Ravna planina is located in the village of Gornje Pale, 20 kilometers from Sarajevo and two kilometers from the center of Pale. From the 2014/15 season this ski resort is open to all visitors and lovers of winter joys. Ski Center Ravna planina has 7500m ski slopes arranged in accordance with the highest standards and the main track length of 1400m, which has been approved and meets all world standards, is also used for the maintenance of the FIS races that were organized this year on the Ravna planina for the second time. Otherwise, this ski resort is connected by a Nordic skiing course and a snowmobile track, 12 km long, with the possibility of recreational Alpine skiing. In its offer Ski Center Ravna planina also has a ski lift with a capacity of 800 skiers per hour, a ski kindergarten and a baby lift, and since this season a gondola for skiers and all interested visitors, which until now was available only in the world ski centers, and since this year, since December 25, also available to all visitors of Ski Center Ravna planina. This gondola is the only one of this type in Bosnia and Herzegovina and it consists of 19 cabins, each carrying 10 skiers, which is 2200 skiers per hour. Infrastructure of this type has so far adorned the world ski resorts and from this season will be available to skiers in Bosnia and Herzegovina. The gondola will move from the Gondola restaurant to the top of the main track, where there are artificial lakeside lakes and another new restaurant Gondola cabin. From this place, all visitors can enjoy the extraordinary view that extends from one side to Pale and Sarajevo, and on the other hand it reaches Jahorina, Zlatibor & Romanija. The purpose of this gondola is not only to be used in the winter season but also to be actively used throughout the year for panoramic sightseeing because it provides a unique feeling. Artificial oscillation of this season will be carried out with the help of 11 cannons. Ski resort Ravna Planina also welcomes the new season with extended restaurant capacities, so the extended restaurant Gondola has 1000 seats with terraces. Within the restaurant there is a fireplace hall for those who enjoy a warm atmosphere, pleasant music or an interesting book, in socializing, celebrations and family gatherings. The entire length of the restaurant extends to the terrace, ideal for enjoying the sunny day, fresh air and an inspirational view of the beauties of Ravna planina. The new restaurant Gondola cabin located at the top of the track has 300 seats. Parking at this ski center for all visitors this year will be free, and also increased capacity with about 1000 parking spaces. 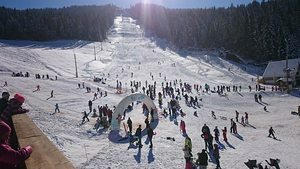 The ski center Ravna planina seriously proposes to become a real recreational center in addition to the diverse offer during the winter season, because the plans for the summer season include bicycle paths, hiking trails, zip-line, lake bathing and many other activities for enjoying nature. 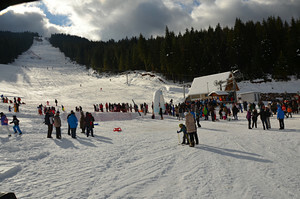 Wonderful ski resort near to Sarajvo. They have excellent restaurant and very good food. Parking is free, playground for children is also free. First cable car in Bosnia is there and many more things. My recommendation is Ravna Planina.